Puja is an act of displaying veneration to God through invocations and various rituals. An important aspect of Puja is to make a spiritual relationship with the Supreme Being. Pujas help people to bring in positivity, improve confidence and attract wealth and prosperity. Puja is an act of expression of compassion and showing reverence to the Supreme God. Pujas are a gateway to establish connection with the Supreme God. Pujas have many fold benefits they cleanse one of negative energies and provide relief from sufferings and provide support during difficult times. Puja are performed at homes and at temples but wherever the Pujas be conducted they should always be conducted in the Vedic way. Pujas can be conducted by using services of Priest or online Puja Services providers. 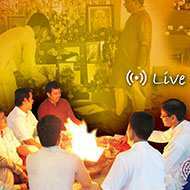 Vedic Puja method includes various rituals, Mantra chanting, Homas, Yajnas and more. Various providers of Puja services will ensure that learned priests will perform your Puja as per Vedic traditions. Pujas are done for seeking divine grace and blessings of various Gods and Goddesses or to achieve specific objectives. Various Pujas are conducted for various purposes such as for obtaining peace, good health, gaining material abundance and spiritual prosperity. Pujas such as Shanti Pujas and Dosh Nivaran Pujas are also very beneficial to ward off negativity. Pujas are powerful and effective practice in one's spiritual journey on the way to enlightenment. Pujas holds utmost significance and thus in addition to general Pujas, special pujas are performed during various occasions and events. Rudra Centre Puja Services provides online Puja Services and also conducts Pujas at various Hindu temples for devotees. Rudra Centre now conducts Pujas in its 4,000 Sq. feet office premise in Mumbai. A beautiful temple has been created with a wonderful ambience for conducting all the Pujas. Rudra Centre has a team of well-versed, karmakandi priests from Shivkashi Temple who perform Pujas as per Vedic rituals. You may call the Pundits for hearing your Sankalpa (wish being taken) or mantras being chanted and would receive blessed Prasad and photographs/ DVD of the worship ritual. Rudra Centre specializes in various Pujas services. Our Pujas for Success include Laxmi Puja, Baglamukhi Puja and Satchandi Puja. We also conduct various Dev Pujas like Shiv Puja, Laxmi Puja and Ganesh Puja. Our Siddhi Pujas include Laxmi Mantra Siddhi Japa, Maha Mrutyunjaya Mantra Siddhi Japa, etc. For Dosh Nivaran, we conduct Pujas like Shani Dosh Nivaran, Pitra Dosha Nivaran Puja, Kaal Sarp Dosh Nivaran Pula, etc. For more than a decade, Rudra Centre has been conducting Pujas like Ati Rudra, Mahamrityunjaya Yagna, Siddhi Laxmi Yajna for the benefit of mankind. You are welcome to visit our centre to participate in the Pujas personally or you can book an online Puja with us.